Abbie joined Yellow Submarine in 2015. 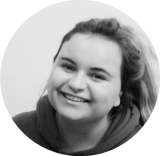 Experience: Abbie has extensive experience working with young people with additional needs, within both educational and social settings. Roles within the charity: Abbie supports at both our adults and young people’s social clubs as well as helping out in the school holidays. Favourite Yellow Submarine memory: Not to be bias but I think one of my favourite Yellow Submarine memories was at breakfast club. The whole group were singing their hearts out to the ‘The Circle of Life’ from The Lion King – they were good enough to be on stage! Summer or Winter? : I like both. I love getting a tan and going to the sea side but Winter has to be my favourite. I really enjoy the festivities and fun that come with Christmas!